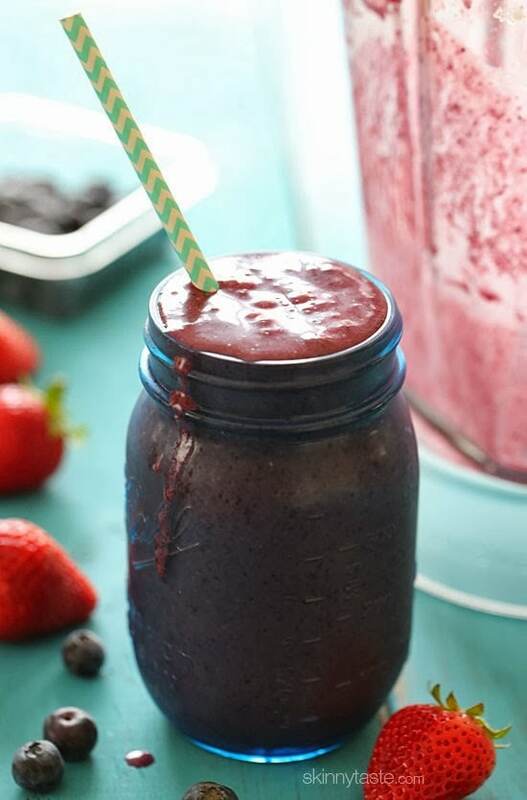 This delicious PB + J Smoothie is made with strawberries, blueberries, peanut butter and almond milk – and it’s my favorite smoothie to order when I’m in my gym. It tastes almost like peanut butter and jelly – but it actually has no grapes. I often make this myself at home; the peanut butter is a great source of protein and keeps me full until lunch and I just love how it tastes. A few of my other favorite protein packed smoothies are Superfood PB Banana and Cacao Green Smoothie, Strawberry Peanut Butter Swirl Smoothie Bowl, and Blueberry Banana PB Smoothie. 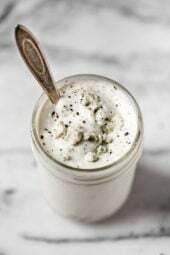 I just got a new KitchenAid 5 Speed Diamond Blender thanks to the Better Blog Retreat and I immediately knew I was going to make this smoothie to put it to the test. The blender is quite powerful and crushes ice perfectly. I give it two thumbs up! 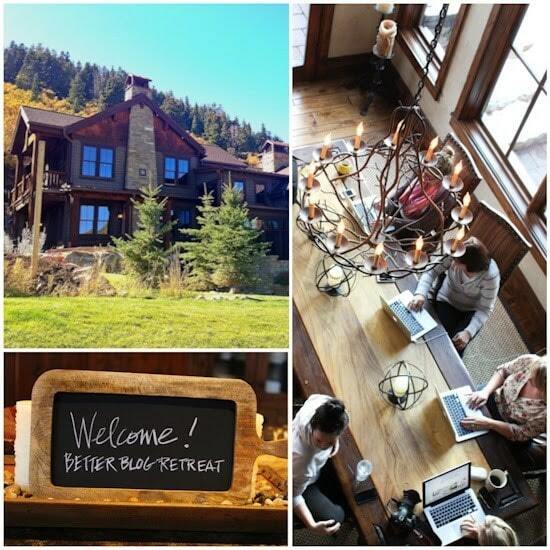 I’ve been doing so much traveling these past few weeks and I’m a bit behind in sharing my amazing four days spent in Park City, Utah with some of my favorite blogging friends for the Better Blog Retreat hosted by Maria from Two Peas and Their Pod and Heidi from Foodie Crush. 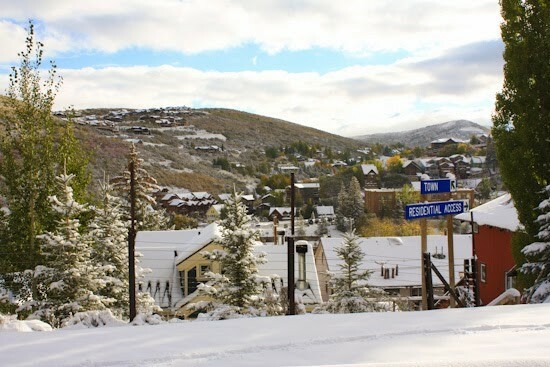 This was my first time in Park City, Utah, but it won’t be my last – it was gorgeous! 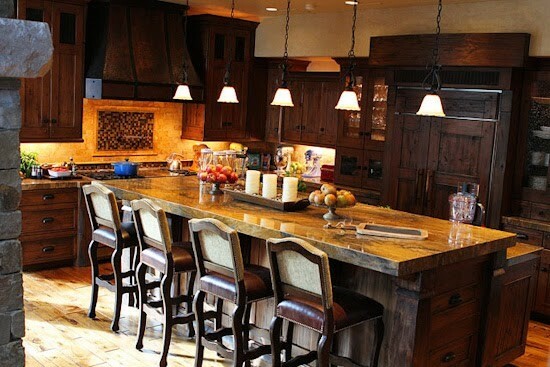 We stayed in a beautiful rustic Anthology Storied Destinations vacation home tucked away in the mountains, so secluded it’s only accessible by a ski slope or a hidden tunnel! The house slept 15 people, plus it has a theater, spa, hot tub… and even an elevator! 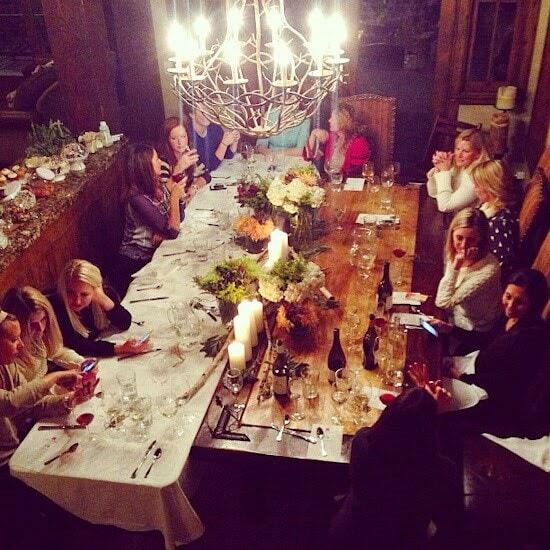 Here’s a photo of us girls sitting around the dining room table, talking, drinking wine, laughing, Instagraming and just having a great time. 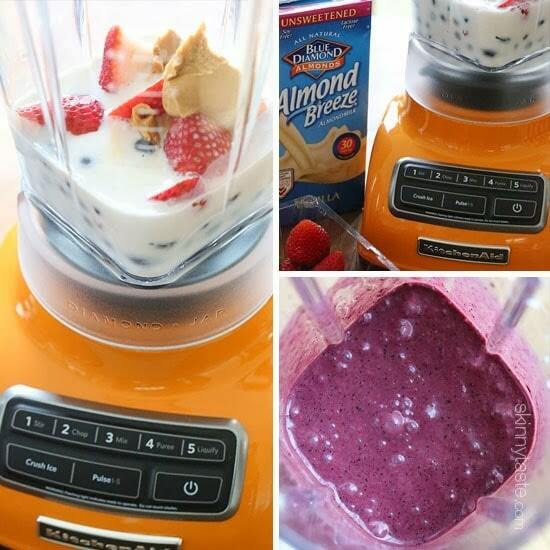 Place all the ingredients in the blender and puree until smooth. Disclosure: This post is sponsored by Blue Diamond Almond Breeze. I only share products I use in my own kitchen on a daily basis. I created this recipe and received compensation to do so. 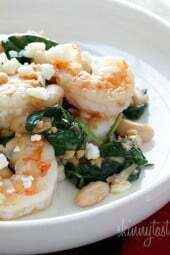 Every recipe I’ve tried from skinny taste has been a hit and that includes this one. I would just suggest making sure the blender is attached correctly, it doesn’t wear as well as it tastes! Is it possible to use grapes or raspberries in place of the blueberries? Oh no! Yes, good tip! Raspberries should work well! Hithere, when I input this recipe into WW tracker i get 8 freestyle points per serving. I think the difference is that i clicked the drink box which makes fruit have points. According to ww this is the right way to add. Would you verify please? Found this post from your menus, which I am really enjoying using. I make almost all the breakfasts and lunches, and many of the dinners, depending on family plans and preferences. I use the previous week as it fits into my meal planning schedule. Can’t wait to try this smoothie next week. Hi Gina! This sounds yummy but when I run it through the WW recipe builder it is 9 freestyle smart points. I think when you were calculating it, you did not check that it was a drink. WW counts smoothies at a much higher point value because you are crushing and processing the fruit in a smoothie, thus, the blender is breaking the fruit down for you and not your body. According to WW, your body treat the fruit in a smoothie more like straight sugar because of how it is processed in the blender. Just wanted to pass along the FYI and the updated freestyle smart point value! This is my favorite smoothie by far. I noticed that the SP were not Freestyle so I entered the recipe into the recipe builder in WW and got 7 Freestyle points for this, and I used powdered peanut butter, which is only 1 SP. If I use 1/2 cup of Blueberries, it goes down to 6 SP. I hate that “This is a drink” checkbox 🙁 I could live on smoothies. Thanks, Gina, for all the great smoothie recipes! Hey Gina. I just came across this *amazing* smoothie recipe, but when I plugged it into WW, it came up as closer to 8 smart points. I am wondering if you clicked the part that said this is a drink, because WW counts the berries as 5 Smart Points when blended into a smoothie. Honestly I’m finding it kind of tough to create truly low point fruit smoothies. I love them though, so I count them anyway. I am obsessed with your smoothie recipes for breakfast. I’ve tried other low-fat recipes but always end up back with these! I am trying this one tomorrow! Its amazing!! Tastes just like a pb sandwich and its kid friendly!! I did too. I don't think she added the fruit in the recipe as blended. With Smart Points fruit is free in recipes unless you blend them like smoothies. I feel like it's a little misleading for those of us truly following the plan. When I plugged the calorie count, etc. into the calculator I came up with 8 SP. 3/4 what of the Almond Milk? Ounce? Cup? Pint? 3/4 cup, thanks for noticing, just fixed it. Hi Gina. Thank you for all you do, it has helped me in my weight loss journey. To be able to cook and eat both healthy and tasty foods, with ww points has been key. 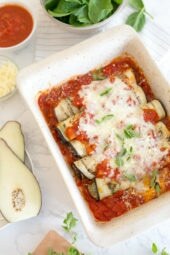 I love this recipe, but wanted to let you know in the new smart points recipe builder there is a blended box that needs to be checked for any foods blended, ie soups, smoothies, etc. This recipe actually calculates to 9 smart points with the box checked 🙁 I even checked with my leader and its the new science behind the plan. @Deb, I think it's only 0 pts if eaten alone (the fruit). I think if you use fruit in recipes they count for pts. I read that somewere, can't remember where. But that would explain why the recipe builder calculates them. This looks soo good, but all your recipes are awesome, so I'm going to give this one a try too. 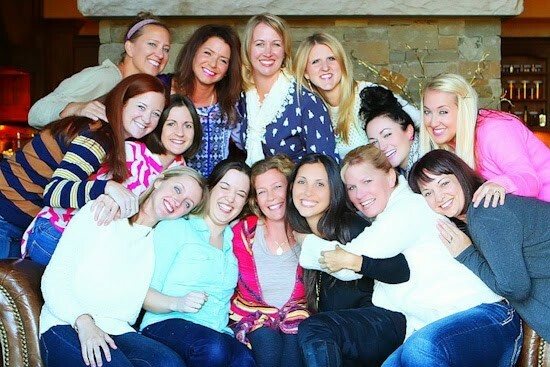 Was wondering where we could find more information about this retreat location…looks awesome…would love to organize a group on ladies and use your new Skinny Taste Planner to plan a week….Keep blogging…Love your recipes and ideas! I was having stomach problems so I went off almond milk and it stopped so I assumed almond milk was hurting my stomach? what else could I use in place that would keep calories down? Any milk will work here. I'm still confused about the points. Pureed fruit is not a juice. Juicing fruit takes out the skin (fiber). You essentially puree fruit when you chew it; it doesn't change the point value. In this recipe you eat the exact same fruit in the recipe which, on its own, would be free (in Points Plus). The Food Tracker counts it as zero. I believe in Points Plus, although the tracker does count the fruit, we are told to omit those points. If you are following the new Smart Points, anytime fruit is blended, the fruit must be counted. Could you use protein powder? What flavor would you recommend ? I am totally obsessed with smoothies. So this sounds like something I would love! Made this for breakfast this morning as am glad I did! Very delicious. I do not like stevia, so I used half a banana to sweeten. I'm sure it changed the taste a little, since I could taste banana a bit, but the PB&J taste still came through for me. Will this keep overnight in the refrigerator? I love smoothies, but never have time to make them in the morning. You can prep everything the night before, keep the fruit frozen and just blend in the morning! not a huge peanut fan, but like PB&J. May have to try this Gee. And I love the pictures from the retreat! awesome! Where did you get your colored mason jars? Hi there. Love your blog! Curious how this is six points though? Why, are you getting less points? I was curious too. I plugged it in but it came up 6. Why is that, if you are using zero point fruit?? I plug it into recipe builder which counts the fruit, but you can calculate it however you wish! When you puree fruit it becomes a juice. If you want zero point fruit you must leave it whole. I just plugged this into the recipe builder online and it jumped up from 4 points to 9 when I checked the box for "blended". My Ww leader told me we must count the fruit. It is 9. I'm glad you enjoyed your visit to Park City – wonderful, isn't it? Were you able to try Cafe Rio while you were here? I loved your lightened up version of their pork barbacoa. Funny I wanted to but didn't get the chance. Gina, have you ever tried using the sweetened almond milk instead of adding sweetner? Almond Breeze has an ingredient called "carrageenan" which I've read is not good for us, so I've switched to SILK almond milk which does not include this. You definitely don't need to use a whole banana with all those berries – about half will provide a good amount of sweetness! I'm not much for stevia or almond milk. Have you tried it without added sweetener and/or with regular low fat milk? For my taste, it needs a little sweetness but it's up to you. Any milk would be fine. Your trip looked amazing! How do get involved in something like that? Hope you enjoyed Utah! 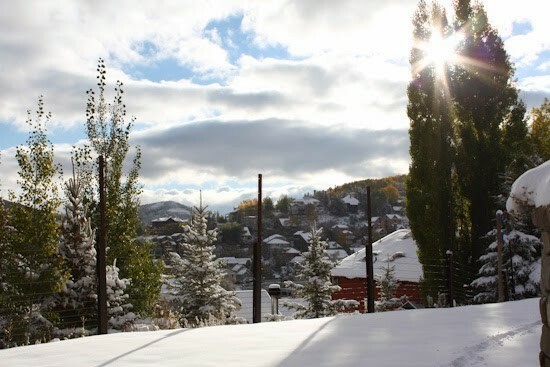 I used to snowboard at Park City such a fun place…oh and I can't wait to try this smoothie! It was the first one, hoping there will be a second! I know it is cold out here in the Northeast but this smoothie was the best part of my day today. Thank you! This will be great for my fiance's son to have after school! He loves PBJ anything. This sounds AMAZING, but then again I am a sucker for anything pb & j related :). Sure, you can! I personally prefer it with real peanut butter after a workout, but sometimes use PB2 or Better Than Peanut Butter. How about making this more calorie friendly by using PB2, or one of the other peanut butter powders that have removed the fat. But the fat in peanut butter is good for you.